Map 5 River North Esk, Edzell. Map 6 Metamorphic zones, Glen Esk. Route maps (Map 5), (Map 6). Walking distance 3 km footpath, 1 km road and 0.5 km moorland. 1. Sediments belonging to the highest group of the Lower Old Red Sandstone of Strathmore: in ascending order, the Edzell Mudstones (200 m), the Gannochy Formation (1400 m) and the Edzell Sandstones (180 m), together making up the Strathmore Group. The Lintrathen Porphyry belonging to the Crawton Group is also exposed in the River North Esk, but is in faulted contact with the Edzell Mudstones to the south-east and with the rocks of the Highland Border Complex on the north-west side, though this contact could be an unconformity. 2. Ordovician rocks forming part of the Highland Border Complex. Currently they are referred to the Jasper and Green-rock 'Series', which is most probably of Lower Ordovician age, and the Margie 'Series' which, on the basis of its rare fossil content, is known to be of Upper Ordovician (Caradoc–Ashgill) age. Detailed comparisons have been made between these rocks and a more complete succession at Aberfoyle and the reader is referred to the paper by Curry et al. (1984) for a full historical review and description. The rocks of the Highland Border Complex are in faulted contact with the Old Red Sandstone to the south-east and with the rocks of the Dalradian to the north-west, and they are themselves cut by several substantial faults, all these faults making up the fault zone of the Highland Boundary Fault. The Jasper and Greenrock 'Series' comprises spilitic (soda-rich) basalts, 'greenstone' conglomerate, phyllite, jasper and chert, while the Margie 'Series' comprises sandstones, quartzites, shales and the Margie Limestone. It is this last which has, on etching in acetic acid, yielded microfossils which have been used to date the rocks (Burton et al. 1984). 3. Rocks belonging to the Dalradian Supergroup. Because of the amount of time involved, following on after the two topics above, the observation of the Dalradian has been deliberately kept to a minimum, one which allows no more than a series of short stops to demonstrate some of the lithologies involved and the rapid rise in grade of metamorphism seen in passing up Glen Esk. Those wishing to examine in more detail the Dalradian succession, Barrow's metamorphic zones, and the phases of deformation which the rocks have undergone, should use the guide to these written by Harte (1987), published in the Geological Society of Aberdeen guide. Adjacent to the Highland Boundary Fault the Dalradian rocks are greywackes showing graded bedding and occasional cross bedding as the commonest sedimentary structures. These, the Glen Lethnot Grits, belong to the Southern Highland Group and are equated with the Ben Ledi Grits of the Perthshire succession, while the Glen Effock Schists further up Glen Esk are equated by Harte (1979) with the Pitlochry Schists of the Perthshire succession. Beyond Millden, passing up Glen Esk, the road crosses the Glen Mark Slide and thereafter exposures are in the Tarfside Group, part of the Argyll Group of the Dalradian. In the Dalradian rocks the grade of metamorphism increases rapidly from the chlorite zone, adjacent to the Highland Boundary Fault, into the biotite and garnet zones within 1 km of the fault. The garnet zone is no more than 1.6 km wide as are the succeeding staurolite and kyanite zones, so that high grade metamorphic rocks are rapidly reached in passing up Glen Esk. This is due to the steepness of the disposition of the zones, which Harte et al. (1984, p. 158) have accounted for by D4 deformation in the 'downbend' adjacent to the Highland Boundary Fault. Route By bus to Dundee via the Tay Road Bridge, thence by A90 to the Forfar bypass, crossing the Sidlaw Anticline in the Sidlaw Hills, and then travelling to the north and north-east along the Strathmore Syncline by A90 until 3 km beyond Brechin. There take B966 north to Edzell. One and a half kilometres north of the village B966 crosses the gorge of the River North Esk at Gannochy Bridge. Dismount at the lay-by beyond the bridge and send the bus on up Glen Esk for 2.4 km to a lay-by on the west side of the road [NO 588 730]. Take the footpath downstream on the west side of the gorge, noticing conglomerates and sandstones in the Gannochy Formation of the Strathmore Group dipping at 50° south-east in the gorge. Access to these rocks is by means of a gully, 275 m downstream from the bridge, where the path bends away from the river for a few metres, or at a flight of wooden steps opposite Gannochy Tower. Hereabouts conglomerates practically die out and this point is taken as the base of the succeeding Edzell Sandstones which consist mainly of rather soft red sandstones and mudstones. The sandstones are ripple marked, contain mud flakes, and are interbedded with blocky red mudstones. A few conglomerate bands are still present but they are thin and the pebbles mainly small. To the southeast the dip decreases until the strata are horizontal some 460 m downstream from the bridge. In the river bank it can be seen that the Old Red Sandstone is overlain by about 3 m of coarse gravels – Quaternary fluvioglacial outwash from Glen Esk. Return to Gannochy Bridge, cross the river and enter the gateway 20 m from the bridge on the north side of the road and follow the footpath upstream on the north-east bank. Much of the gorge is difficult of access and can only be examined in short stretches. It is excavated for the next 1,000 m in conglomerates, sandstones and occasional mudstones of the Gannochy Formation. These are all red in colour. Mud-stones are well exposed 200 m above the bridge in beds up to 2.4 m thick and dipping at 55–66°SE. The sandstone bands are often pebbly or gritty, cross bedded and contain large mica flakes. The conglomerates contain a wide variety of rock types. Quartzite is the most abundant pebble type, but porphyry, andesite, granite, felsite and schist are all present. The proportions of the various rock types present vary from one bed to another, and that variation was investigated by Peacock (1961, pp. 27–33). He found that there was a decrease in maturity, reflected in a decrease in the quartzite + quartz pebble content, upwards through the Gannochy Formation, thus implying great uplift in the source area. Gneiss pebbles constitute up to 25 per cent of the total pebble content in the less mature conglomerates and these rocks also contain considerable amounts of porphyry, granite and sedimentary pebbles, many of which are absent from the more mature rocks. Haughton et al. 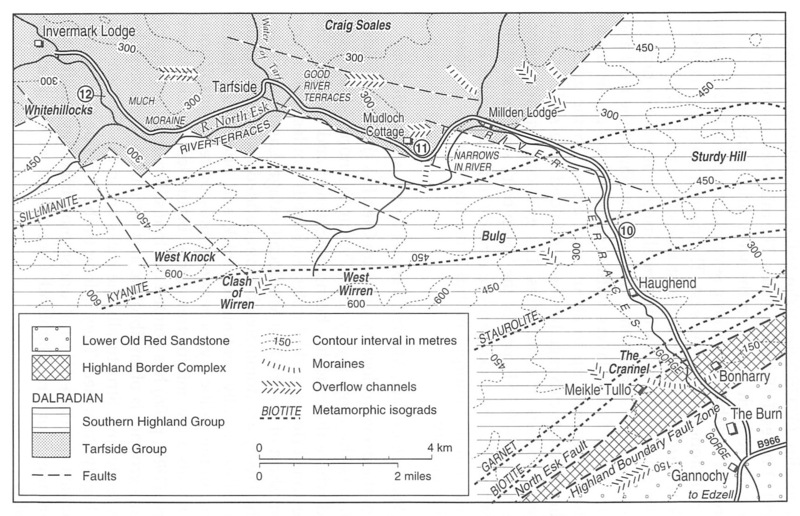 (1990) have argued strongly that Lower Old Red Sandstone conglomerates in south-east Kincardineshire have a northerly source, from an area resembling the Grampian terrane of north-east Scotland, discrepancies being explicable in the unroofing history and the possible involvement of pre-existing conglomerates. Gilchrist (1988) in analysing the conglomerates and their sedimentary structures identified debris flow deposits as the main form present, i.e. those of alluvial fans coming off a mountainous source to the northwest with sufficient sediment being available to overflow channels on the surface of the alluvial fans. He too postulated a source area comprising principally 'acid plutonic and volcanic complexes intruded into a metamorphic terrane' (Gilchrist 1988, p. 43). The conglomerate, which is now almost vertical, can best be examined at the remains of Loups Bridge, where it is continuously exposed for 230 m in the bed and banks of the river, see (Plate 1). Thereafter the gorge dies out and the river flows between mounds of fluvioglacial gravels. In this reach of the river the rocks consist of brown limonitic sandstones and mudstones, the Edzell Mudstones, at the base of the Strathmore Group of the Lower Old Red Sandstone, occurring in a series of NE–SW striking minor folds with dips of 30°–75°. Unfortunately exposures, which can only be seen when the river is low, are much better on the west bank which is difficult to reach. The sandstones and mudstones of the Edzell Mudstones Formation continue upstream for 230 m to the outcrop of the Lintrathen Porphyry, an ignimbrite at the top of the Crawton Group of the Lower Old Red Sandstone. Commonly weathered to a creamy colour, it is a purplish rock when fresh with small phenocrysts of quartz and biotite visible in the hand specimen. It can be seen at low water 500 m upstream from Loups Bridge, abreast of a large erratic block in the middle of the river. The porphyry is believed by Armstrong and Paterson (1970) to be separated from the Edzell Mudstones to the south-east by a major fault and from the rocks of the Highland Border Complex to the north-west by another fault. Neither fault can be seen in the river section. Two hundred and seventy-five metres beyond the Lintrathen Porphyry two large Spanish chestnut trees, one on either side of the path, afford a useful landmark. Forty-five metres beyond them large exposures of creamy-grey, gritty, dolomitic and quartzitic sandstones belonging to the Margie 'Series' of the Highland Border Complex can be examined at the water's edge. They are vertical, thin bedded and sometimes micaceous, and a short distance upstream are folded into an anticline plunging to the north-east. Minor puckering is present and small faults cut the sandstone on both banks. (There are two footbridges on the path here within 70 m.) For 180 m upstream beyond the anticline the dip varies from 20° to vertical, but the general inclination is about 45° NW. Occasional dolomitic, silty or shaly beds occur in the sandstone and there is often a hematitic stain. At this locality two NE–SW (late Carboniferous) dolerite dykes cut the sandstones, the first about 9 m thick and the second about 18 m thick. The river narrows here and the second dyke forms bluffs on both banks so that the path climbs steeply at this point. By walking across the dolerite of the second dyke at the river's edge the contact can be seen between the dyke and mid- to dark grey phyllites of the Margie 'Series'. About 15 m back from the river and about 10 m upstream from the dyke is a crag 5 m high of coarse breccia, comprising mainly fine-grained basic igneous rock, but including blocks of limestone with white calcite veins, together with a rather dark grey shaly matrix. Over a century ago this, the Margie Limestone, is said to have been quarried at this locality and also on the west bank. The last 60 m up the gorge before it becomes inaccessible at river level comprise purple, limonitic and dolomitic greenstones, strongly crumpled and with steeply plunging minor folds, part of the Jasper and Greenrock 'Series'. Barrow (1901, p. 330) believed them to be thrust over the sediments. Return to the path at the top of the gorge and continue upstream. The path after traversing fluvioglacial gravels is cut into greenstones of the Jasper and Greenrock 'Series' for several hundred metres. Little of the original nature of these rocks can be seen in this vicinity, shearing being intense, but occasional pillow-like forms occur, and Henderson and Robertson (1982, p. 435) believed them to be pillow lavas. The greenstones are sometimes serpentinous, sometimes phyllitic. There is little to be seen at the riverside hereabouts that cannot be as easily seen along the path except for a 3 m lens of dolomitic sandy sediments striking NE–SW exposed at the riverside abreast of an ornamental 'arbour' on the path 280 m beyond the thicker dyke. Fifty-five metres beyond the arbour, where the path runs through a cutting blasted out of the greenstones, there are excellent exposures of red jasper. These commonly comprise isolated masses of jasper up to 1 m thick, though others are more persistent and up to 3 m across. One at least lies above a fault plane. It seems unlikely that the jasper represents a distinct bed of sediment infolded into the greenstones in isoclinal folds as was suggested by Barrow (1901). Purple and reddish phyllite bands are present within the greenstones and some of the jasper is associated with these. Black chert is less commonly to be seen. The schistosity strikes north-east and generally dips north-west but is locally vertical, while fault planes have similar attitudes. Beyond the cutting the path swings to the north-east to leave the river and rises until it reaches the lay-by on the road at [NO 588 730]. The river runs in a small gorge cut in the greenstones for another 600 m upstream, the gorge gradually becoming shallower. From the lay-by walk 140 m up the road to a gate on the west side 10 m before power wires cross the road. There a track leads past a gravel pit in the fluvioglacial gravels and after 150 m crosses a small stream draining swampy ground between the road and the river. Cross the stream and follow the faint path just above the river bank for 140 m upstream until it starts to descend from the river terrace towards a now almost overgrown quarry at the river bank. The exposures for 140 m along the bank of the river to just beyond the quarry extend through the rocks of the Highland Border Complex to the North Esk Fault and into the Dalradian greywackes beyond. A similar but by no means identical sequence can be made out on the opposite bank of the river, but it is not advisable to attempt to wade the river even in the dry season. Working up-river on the north-east bank the sequence consists first of greenstones (a) and then phyllites (b) dipping at 40–60° NW and predominantly green in colour. These are followed by a gap in the exposures which is little more than 30 cm wide at low water and believed to be occupied by a fault. Beyond this gap occur 30 m of conglomerate (c) with pebbles, up to 12 cm in diameter, of greenstone and occasionally jasper in a green matrix. 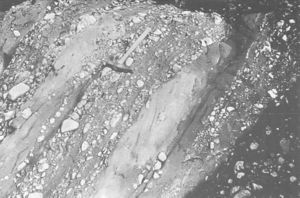 Shackleton (1958, p. 368) found graded bedding within gritty material in this conglomerate, which indicates younging to the south-east, i.e. that the conglomerate, which dips to the north-west at 70–80°, is overturned. Upstream, 3 m of sheared green gritty rock (e) next to the conglomerate marks the upstream limit of the Jasper and Greenrock 'Series' and is followed by about 30 m of platy quartzitic sandstone (f) of the Margie 'Series' dipping at 70–85° north-west. Here too Shackleton (1958, p. 368) found graded bedding younging to the south-east. Thus far there is agreement between the section [[Media:FANG_FIG_06.jpg|(Figure 6) and the exposure. Beyond here there are gaps in the exposures and the interpretation is uncertain. After a gap in the exposures, 8 m of creamy, buff-weathering shales are believed to form part of the platy quartzitic sandstone (f) and 2.5 m further upstream 5 m of buff-weathering grits crop out at the south side of the old quarry. After a further gap the Margie Limestone (i) is exposed in the river at low water. It is pale grey with quartz grains weathering out on the surface, and cut by frequent white calcite veins. Almost immediately upstream from the limestone, and also forming a ridge in the quarry floor, are very dark grey shales and pencil shales, believed to be the black shales (h) of Pringle's section, where they lie in the small syncline south-east of the North Esk Fault. The limestone (i) reappears at the river bank a few metres further upstream to be followed by gritty, grey shales (g) and quartzose grit with quartz veins (f) which also forms the north face of the quarry. Pringle's interpretation of the succession seems to fit reasonably well the exposures seen at low water, but it is by no means universally accepted: e.g. Shackleton (1958) believed the succession to be the other way up. The fossil evidence indicates that the Margie Limestone is Upper Ordovician while the greenstones are Lower Ordovician in age (Curry et al. 1984, p. 124). Units (f) to (i) are all part of the Margie 'Series'. A gap in exposure beyond the last of the Highland Border Complex rocks marks the position of the North Esk Fault, the most north-westerly fault of the Highland Boundary Fault zone in this section, and is followed by pale grey phyllites of the Dalradian. The North Esk Fault, Barrow's 'major overthrust' (1912, p. 287), is not exposed on either bank of the river but separates the Dalradian from the Highland Border Complex. Dalradian rocks are exposed, after a gap, for several hundred metres up the river and consist initially of semipelites and then of coarser-grained greywackes, the latter cut by quartz veins, often of considerable thickness. Dips are consistently to the north-west at 55–85°, but the graded bedding in the rocks shows younging both up and down the river, thus implying isoclinal folding, though fold hinges are seldom seen. These rocks are in the chlorite zone of regional metamorphism. Return to the bus by the same path. This locality [NO 573 757] lies 100 m SSE of the milestone I (Invermark) 11 miles, E (Edzell) 5 miles. The milestone is grey, about half a metre high and is on the west side of the road. There is an area suitable for parking several cars about 50 m beyond the milestone and on the east. The nearest bus park is 900 m back towards Edzell on the east side of the road [NO 575 752]. The exposure consists of several ridges about lm high of coarse-grained Glen Lethnot Grits within 50 m of the road and on the east. Pelitic layers within these are of garnet-micaschist, the garnets up to about 1 mm across. In the grits the earlier fracture cleavage has been refolded on a scale of centimetres to tens of centimetres. The grits carry quartz veins. The dip is 45–75° SE, part of the 'steep belt', south-east of the 'downbend'. The rocks here are already in the staurolite zone of regional metamorphism, but staurolite is scarce or absent at this locality. From the previous locality drive up Glen Esk through Minden as far as the large lay-by [NO 527 779] on the north side of the road where the road has been straightened and opposite the milestone I (Invermark) 7 miles, E (Edzell) 9 miles. This is just 100 m short of the track to Mudloch Cottage. Large exposures at the lay-by are dominated by thin-bedded psammites, clean quartzites, usually centimetres thick and often with quartz veins. In the pelitic layers between, muscovite is conspicuous in crystals a few millimetres across, biotite less so. 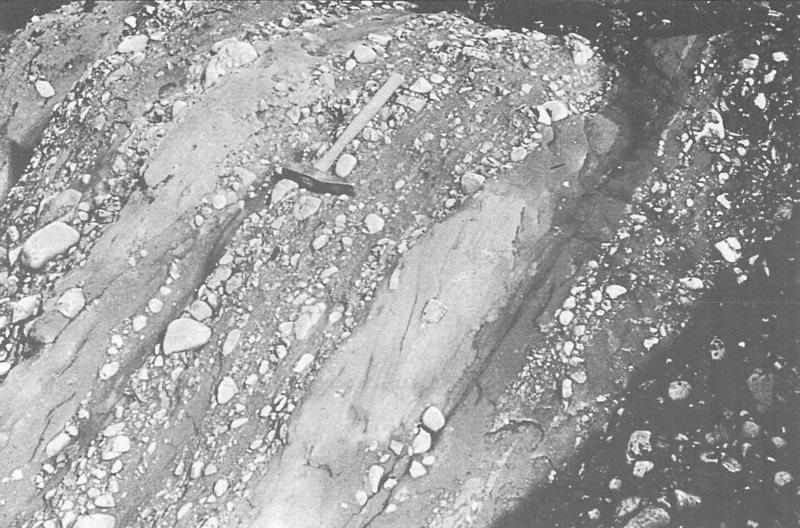 Elsewhere Harte (1987, p. 206) has pointed out that sillimanite, over much of this ground, is often fibrolitic and difficult to see except by thin sectioning. Structurally the rocks are in the 'flat belt' and are highly deformed. They belong to the Tarfside Group, one in which quartzite is a not uncommon lithology, unlike the overlying Southern Highland Group seen at the previous locality. Continue up Glen Esk past Tarfside Village, past the entrance to Glen Effock and as far as the footbridge to Whitehillocks Filter Station [NO 453 796]. There is nowhere to park a bus here, but it can turn 1 km further on at the large car park at Inver-mark [NO 447 803] and return by arrangement. Cars can be parked among the trees a short distance beyond the bridge. The footbridge is locked but there are numerous exposures on both sides of the river downstream from it. Quartzites are again present together with pelites and calcsilicate rocks, some cut by calcite veins. These rocks also belong to the Tarfside Group. Locally granitic veins occur and the rocks here too are in the sillimanite zone of regional metamorphism. The foliation dips to the south-east at low angles. Return to St Andrews by retracing the outward route. ARMSTRONG, M. and PATERSON, I.B., 1970. The Lower Old Red Sandstone of the Strathmore Region. Rep. Inst. Geol. Sci. 70/12. BARROW, G., 1901. On the occurrence of Silurian (?) rocks in Forfarshire and Kincardineshire along the eastern border of the Highlands. Quart. Jour. Geol. Soc. Lond. 57, 328–45. BURTON, C.J. et al., 1984. Chitinozoa and the age of the Margie Limestone of the North Esk. Proc. Geol. Soc. Glasgow., 124/125, 27–32. CURRY, G.B. et al., 1984. Age, evolution and tectonic history of the Highland Border Complex, Scotland. Trans. Roy. Soc. Edinb., Earth Sci. 75, 113–33. GILCHRIST, A., 1988. Sedimentation and provenance of the Gannochy Formation, River North Esk, Edzell. Unpublished St Andrews Univ. honours thesis. HARTE, B., 1979. The Tarfside succession and the structure and stratigraphy of the Eastern Scottish Dalradian rocks. In Harris et al., The Caledonides of the British Isles — reviewed. Spec. Publ. Geol. Soc. Lond. 8, 221–8. HARTE, B., 1987. Glen Esk Dalradian, Barrovian metamorphic zones. In Trewin, N.H., Kneller, B.C., and Gillen, C. Excursion guide to the geology of the Aberdeen district. Geological Society of Aberdeen. 193–210, Scottish Academic Press. HARTE, B., et al., 1984. Aspects of the post-depositional evolution of Dalradian and Highlands Border Complex rocks in the Southern Highlands of Scotland. Trans. Roy. Soc. Edinb., Earth Sci. 75, 151–63. HAUGHTON, P.D.W. et al., 1990. 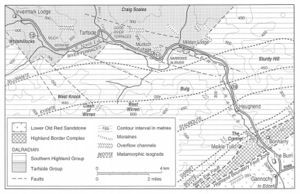 Provenance of Lower Old Red Sandstone conglomerates, SE Kincardineshire: evidence for the timing of Caledonian terrane accretion in central Scotland. Jour. Geol. Soc. Lond. 147, 105–20. HENDERSON, W.G. and ROBERTSON, A.H.F., 1982. The Highland Border rocks and their relation to marginal basin development in the Scottish Caledonides. Jour. Geol. Soc. Lond. 139, 433–50. PEACOCK, D.P.S., 1961. The Old Red Sandstone rocks of the Edzell District. Unpublished St Andrews Univ. honours thesis. PRINGLE, J., 1942. 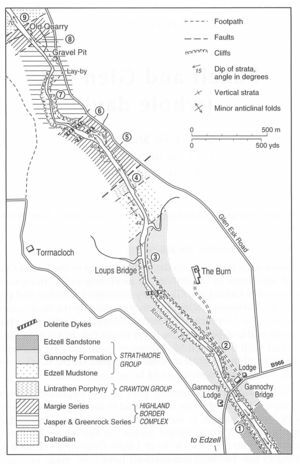 On the relationship of the green conglomerate to the Margie Series in the North Esk, near Edzell; and on the probable age of the Margie Limestone. Trans. Geol. Soc. Glasg. 20, 136–40. SHACKLETON, R.M., 1958. Downward-facing structures of the Highland Border. Quart. Jour. Geol. Soc. Lond. 113, 361–92. This page was last modified on 23 February 2019, at 09:21.